Insects represent over half of the planet’s biological diversity. 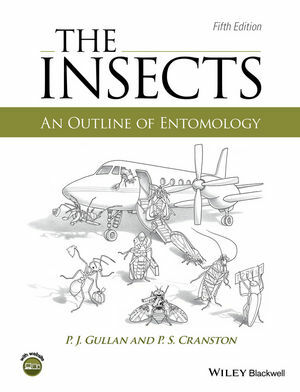 This popular textbook provides a comprehensive introduction to this extraordinary diversity, and places entomology central to the theory and practice of evolutionary and ecological studies. structure, function, behaviour, ecology and classification are integrated with appropriate molecular studies. Much of the book is organized around major biological themes: living on the ground, in water, on plants, in colonies, and as predators, parasites/parasitoids and prey insects. A strong evolutionary theme is maintained throughout. There is major revision to the chapter on systematics and a new chapter, Insects in a Changing World, includes insect responses to, and the consequences of, both climate change and human-assisted global alterations to distributions. Updated ‘Taxoboxes’ demonstrate topical issues and provide concise information on all aspects of each of the 28 major groupings (orders) of insects, plus the three orders of non-insect hexapods. New boxes describe a worrying increase in insect threats to landscape and commercial trees (including eucalypts, palms and coffee) and explain the value of genetic data, including evolutionary developmental biology and DNA barcoding, in insect biodiversity studies. The authors maintain the clarity and conciseness of earlier editions, and extend the profuse illustrations with new hand-drawn figures. Over 50 colour photographs, together with the informative text and an accompanying website with links to video clips, appendices, textboxes and further reading lists, encourage a deeper scientific study of insects. The book is intended as the principal text for students studying entomology, as well as a reference text for undergraduate and graduate courses in the fields of ecology, agriculture, fisheries and forestry, palaeontology, zoology, and medical and veterinary science. Penny Gullan and Peter Cranston are adjunct professors in Evolution, Ecology and Genetics, in the Research School of Biology, The Australian National University, Canberra, Australia, where they conduct research on the biodiversity and systematics of Coccoidea and Chironomidae, respectively. Both maintain emeritus connections with the Department of Entomology and Nematology, University of California, Davis, USA.